California liquor regulations prohibit guests from bringing any alcohol into The Diamond. Alcohol may not be removed from the ballpark at any time. Guests who appear to be under the age of 30 will be required to show proper identification. Guests will be limited to two alcoholic beverages per transaction. All sales of alcoholic beverages cease at the end of the 7th inning. The Storm reserve the right to refuse or discontinue service of alcoholic beverages at any time. Only certified service animals or service animals in training are allowed at The Diamond. All other animals are prohibited. *Except on Dog Day!! For your convenience, a Guaranty Bank ATM is located on the concourse behind section 105. Fans are welcome to attempt to obtain autographs prior to and following home games. There are several areas near the playing field that may facilitate obtaining autographs. When seeking an autograph outside your designated seating assignment, you may be asked to return to your ticketed seat. The players and coaches are prohibited from signing autographs during the game. All bags and personal items are subject to search upon entrance into The Diamond. Any confiscated items must either be discarded or returned to a vehicle. The Storm is not responsible for any prohibited items left at the gates. The Storm request that banners and signs not be placed in the direct sight lines of the batter or the other guests. Signs and banners may not be hung over the railings or disrupt the game in play at any time. The content of the banner may not be political, commercial or obscene in nature. 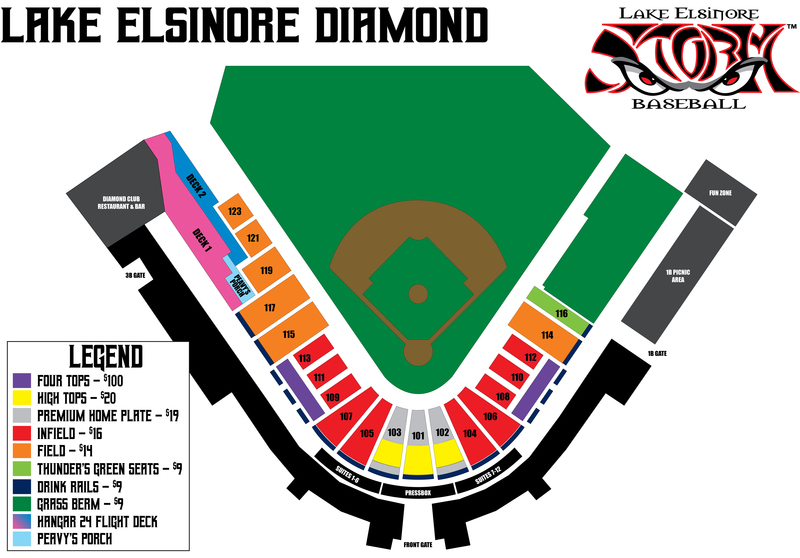 The Lake Elsinore Storm reserve the right and have sole discretion to permit or remove any sign or banner from the ballpark at any time. Batting practice is only open to the general public on dates specified by the Lake Elsinore Storm. The Lake Elsinore Storm offer the custom birthday packages for children of all ages. Make a long lasting memory with Thunder and the Storm. Call 951-245-4487 for more information. The 2019 season of Storm baseball is broadcast on KMYT 94.5FM and also iHeart radio. A link on the website allows for fans to listen online as well. Catch Sean McCall as he delivers the exciting play-by-play for every Storm game. Guests of The Diamond are allowed to bring in still cameras as well as video cameras for personal use only. Those wishing to use tripods or other video equipment are asked to contact a Lake Elsinore staff member for assistance. When using cameras or camcorders, please be courteous and not obstruct the views of other guests. Any video or photography of The Diamond or Storm players and coaches cannot be used commercially without written permission from the San Diego Padres. Children three years of age and under are allowed to enter The Diamond without a ticket, but must be lap held and not occupy an additional seat. Children over the age of four must have a ticket for entrance. The Storm players and front office are visible and caring members of the community. Thunder, the Storm mascot, makes hundreds of appearances to promote literacy with the Reading for Rewards and Summer Reading Program. The organization often makes donations in support of local fund raising efforts. Donation requests should be done online at the Storm website under the heading of "Communities." From the months of April thru September, player appearances can be arranged as well. All donation and appearance requests must be made no less than two weeks prior to the event. The Diamond has several fixed and portable concession stands offering the standard ballpark fare of hamburgers, hot dogs, peanuts and cracker jacks. The Diamond Club is a full-service restaurant with a wide variety of options that can be enjoyed at a table inside or a to go order to enjoy in the stands. Visa, Mastercard, American Express and Discover are all accepted forms of payment for ticketing, food and retail purchases. A valid ID is required for all credit card purchases. Parking for disabled guests is available in both parking lot A and B. All vehicles wishing to park in handicapped spaces must display proper license plates or placards. The cost for parking is $10. Disabled seating is available behind home plate, the first base line and the third base line. Contact the Storm Ticket Office for more information regarding handicapped accessible seating. To apply for a seasonal position with the Lake Elsinore Storm, you must contact the Storm's staffing company Thunder Staffing and Business Development. Thunder Staffing can be reached by phone at 951-609-1415 or by e-mail at info@thunderstaffing.com. You can also visit their website, www.thunderstaffing.com for more information. Full-time positions are posted on www.teamworkonline.com. Please be advised that items sent through the mail to be signed are done so at your own risk. The Storm are not responsible for items not signed or returned to the sender. If a regular season game is not played, your ticket stub may be exchanged, subject to availability, for a ticket of equal or lesser value, good at any Lake Elsinore Storm regular season home game excluding exhibition games or Independence Day celebrations. Personalized birthday or other celebratory messages can be displayed on the video board in left field for a small donation to a local Lake Elsinore Charity. Guests should visit the Thunder Staffing Information Booth upon arrival to the ballpark. The Storm do not guarantee all messages will be displayed. Full season tickets offer you the best seats - of your choice - for all 70 home games. With discounted prices, unused ticket exchanges and guaranteed giveaways, you can't lose! Mini Plan packages beginning at seven games are also available. Contact the Storm front office at 951-245-4487 for more information. The Diamond is a smoke-free facility. Guests who wish to smoke while at The Diamond are required to utilize the designated smoking areas located outside of the gates. Guests are prohibited from disturbing banners, booklets, business cards, commercial advertising, flyers, folders, handbills, leaflets, notice, pamphlets, or any other written or printed materials without permission from the Lake Elsinore Storm. In addition, the Storm prohibit the placing of any of the above listed items on the windshields of parked vehicles. Suites are available to rent on a full-season basis. For availability of suites for the upcoming season, contact the Storm front office at 951-245-4487. Tailgating is permitted in Lot C. Parking is pay per space, at $10 per space. Any alcohol and glass is prohibited. No open flames allowed. Guests receive a separate e-mail containing their print at home tickets. However, if their system has a spam blocker enabled, the attachment may be blocked. Guests must have Adobe Acrobat software (free online) to use this option. Tickets may be picked up at any open ticket window during normal business hours. Guests should bring a photo ID when picking up tickets at will call. Tickets ordered over the phone at least one week prior will be mailed first class. The Diamond offers guided tours for groups wishing for a behind the scenes look of the stadium. For more information contact the Community Relations department. Umbrellas are not permitted inside the ballpark. One 20 oz sealed bottled of water is allowed per person. No other outside food or beverage is allowed through the gates.